The course is for adult (16+) beginners, and no experience of rowing is necessary. On the course qualified coaches and a team of helpers will teach you the basics of rowing, sculling, coxing and indoor rowing. Exit routes allow you to make the transition into the club, by joining either the recreational rowing group or the development squad. Over the last 5 years the Learn to Row programme has enabled DARC to become the fastest growing rowing club in the country. Please contact us on explorerowing@durham-arc.org.uk if you have any questions, we aim to make the process as smooth as possible! Please return the registration form together with payment of course fee of £95 payable to ‘Durham ARC’. Envelope should be addressed to Learn to Row, Durham ARC, City Boathouse, Green Lane, Durham DH1 3JU. Junior Learn to Row for beginners aimed at young people aged 11 – 15. Please return the registration form together with payment of course fee of £65 payable to ‘Durham ARC’. Envelope should be addressed to Junior Learn to Row, Durham ARC, City Boathouse, Green Lane, Durham DH1 3JU. There is an answerphone if we are out coaching! The Allcomers Regatta is held towards the end of June or early July. All you need is 4 people from your pub, club, company, or group of friends. 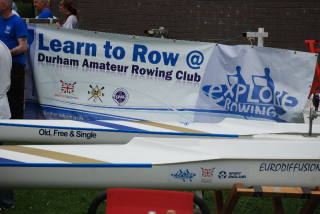 Durham Amateur Rowing Club will provide you with a coach, all necessary equipment and 4 practice sessions to mould you into a racing unit. Then you compete in this fun regatta, over a short 300 metre course against allcomers.